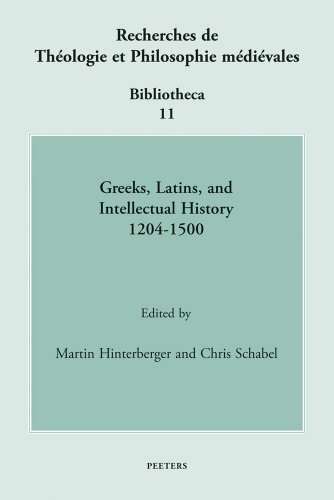 This volume presents papers from sixteen established scholars who investigate the intellectual connections between the Greek East and the Latin West in the crucial period between the conquest and sack of Constantinople in the Fourth Crusade and the close of the Middle Ages, when the migration of Byzantine scholars to the West fertilized the humanist trends that were transforming European thought. In connection with issues in education, philosophy, science, theology, ecclesiology, and politics, the papers cover such subjects as Greeks in the papal Curia and Western academies and universities, Dominicans in Constantinople, Greek translations of Latin works and their influence on Orthodox doctrine, debates over the Filioque and the Latin use of unleavened bread in the Sacrament of the Eucharist, the image of Latins in Orthodox hagiography, and the reception of the patristic tradition. The volume should serve as a catalyst for further research in this neglected yet important field.